I’ve started to realise that my blog entries this year have gradually progressed from exercise based subject matter to face stuffing and todays blog is another foody one. Let’s blame the weather as we head into winter, but somebody let me know if May comes around and I’m still yattering on about food. 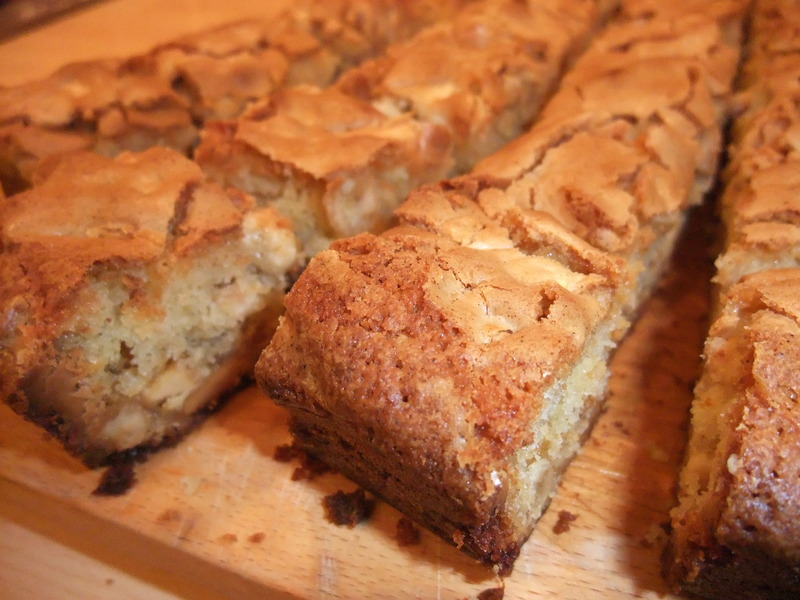 This is one of those cakey recipes that I keep coming back to, not because it is necessarily my favourite but people seem to demand it (yes – I’m talking about you sugar fiends at work). It’s dead simple and you can’t go too far wrong. 1) Grease and line a 27 x 19cm baking tin and preheat the fan oven to 180 degrees. 3) While this is going on roughly chop the hazlenuts. These are soft nuts and you don’t want to end up with powder so I lightly crush them with the flat surface of a knife to break them into large peices without creating a pile of sawdust. 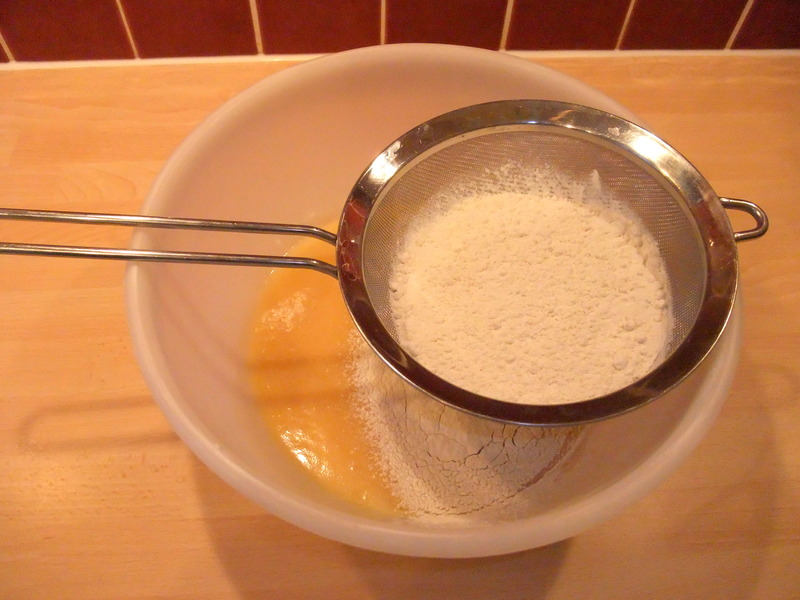 5) Whisk the eggs & sugar together until smoothish. Then stir in the slightly cooled butter mix and the vanilla extract. 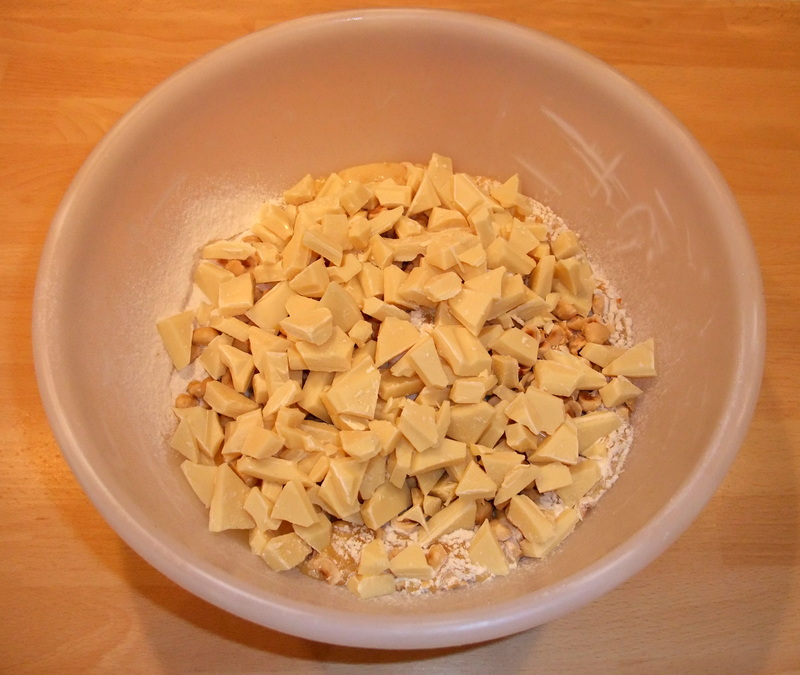 6) Next sift the flour and salt into the bowl. 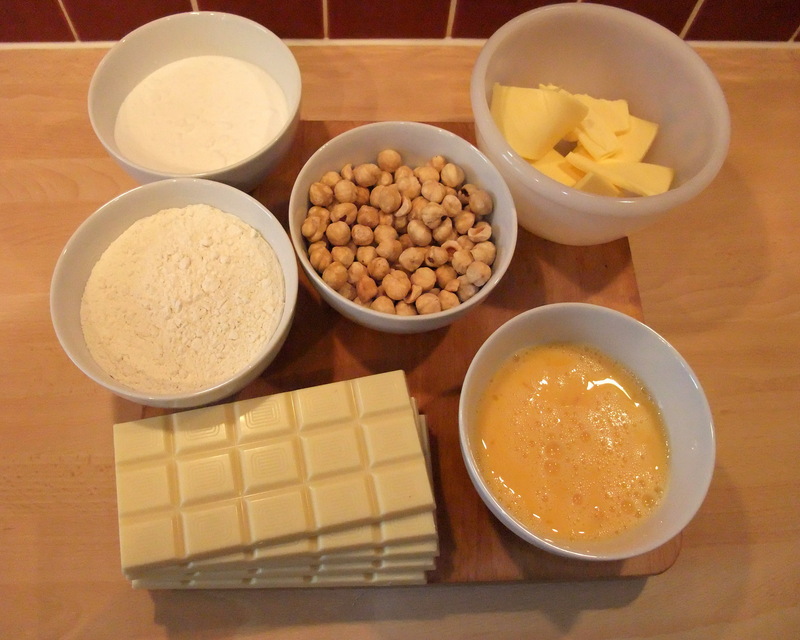 7) Chuck the chopped hazlenuts and chocolate into the bowl. I always judge there to be a little “too much” chocolate so I couple of bits end up wasted. Again, recycling suggestions welcome. 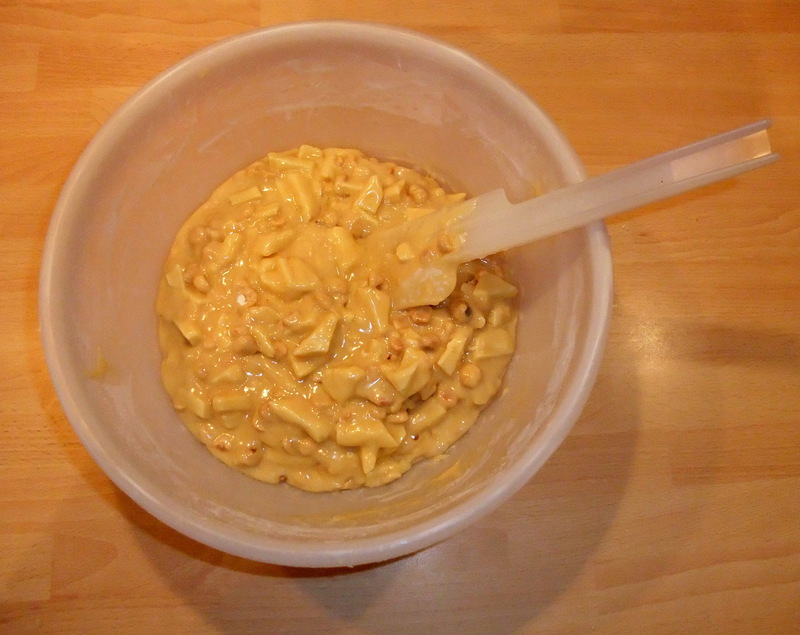 8 ) Fold the mixture into itself until you have a big sticky gloopy bowl of dietary doom. In truth it isn’t beautiful to look at by this stage. With some recipes at this point you are tempted to lock the doors, take the phone off the hook and sit on the kitchen floor finishing off the mixture while you wonder what to watch on TV tomorrow as you take the day off sick. This is one of those recipes where the palid sweet raw ingredients aren’t as tempting as the finished product. 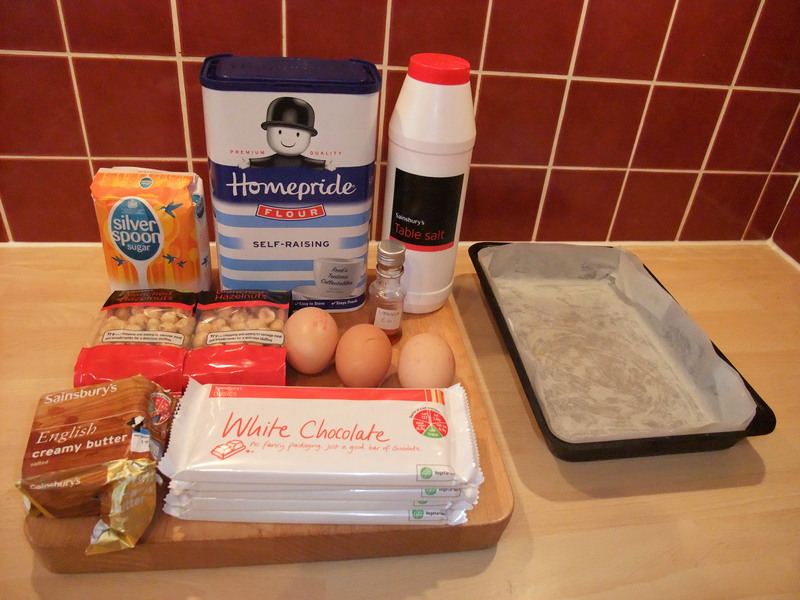 9) Spoon the mixture into the baking tin and bung it in the oven for approx 35 minutes. You are looking for brown/golden at the edges and risen/just firm at the centre. It’s still going to taste great give or take 5 minutes but overcook it and it doesn’t look so good while undercook it and it will collapse when you try to slice it. 10) Leave to cool. No LEAVE IT! Go and do something else you impatient pig. 11) Slice it and store in an airtight container taking care to store it in a secret location. It should keep for about 3 hours, unless you really do get sick of it. Alternatively take it to work and leave it in the kitchen where a mysterious bermuda style food triangle almost instantaneously spirits away any goodies that pass through it. Two questions immediately spring to mind: What is cornmeal? What is potato starch? Google tells me that cornmeal is polenta (well why didn’t you say?) and that potato flour is a thickening agent. I have polenta in the cupboard and make an executive decision that cornflour will make an adequate substitute for potato flour. As for measurements I make 3/4 quantity because I only have 150ml yoghurt. Let’s cook! 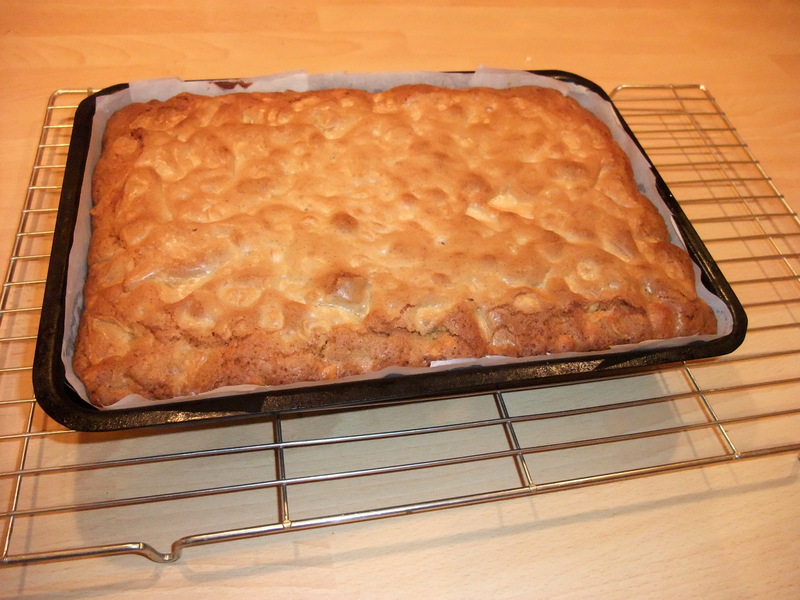 1) Grease and base line a 450g baking tin with baking paper and preheat the fan oven to 170 degrees. 2) Prepare the ingredients; Melt the butter, deseed and finely chop the chilli, finely slice the spring onions. 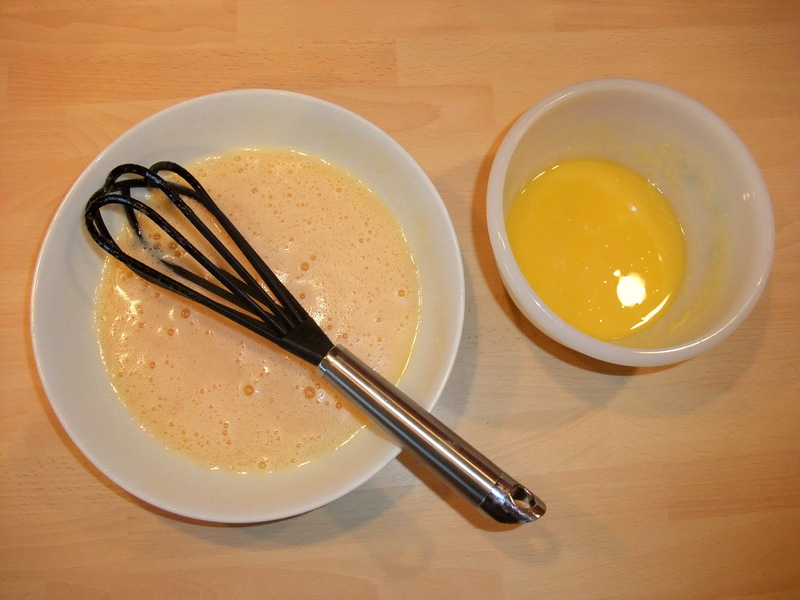 3) In a large bowl whisk the egg until it’s frothy, then add the melted butter and the Greek yoghurt. 4) Add the dry ingredients and seasoning. Give it a good old mix. 4) Stir in the vegetables and parmesan. 6) Cook in the oven until you have finished watching Used Car Roadshow and then remember in panic that you left the bread in the oven some time earlier. Discover that it is cooked perfectly. Alternatively you may wish to leave it in for 45 minutes. Leave to cool for 10 minutes on a wire rack. Turns out this is really nice, moist, rather spicy and very different. It is great served fresh from the oven with a little butter or margarine. If you let it cool I recommend you give it a few seconds in the microwave to warm it through and release the flavours. Thought I would share this recipe I made at the weekend because despite being barking mad and making no sense whatsoever it happens to produce a rather yummy soup. It’s called “Locro de papa”, a mexican dish which according to Babelfish translates into English as “Locro of pope”. So now you know. 2 ) Heat the annatto seeds in a couple of tablespoons of oil in a pan on a low heat for a few minutes until the oil has taken on the red colour of the seeds. 3 ) Remove the seeds and retain the oil. Add the onion and garlic and fry until the onion starts to soften. 4 ) Add half the potatos plus the Cumin, pepper and oregano. Stir. 5 ) Pour in 800ml of water, cover and simmer until the potatoes start to fall apart. 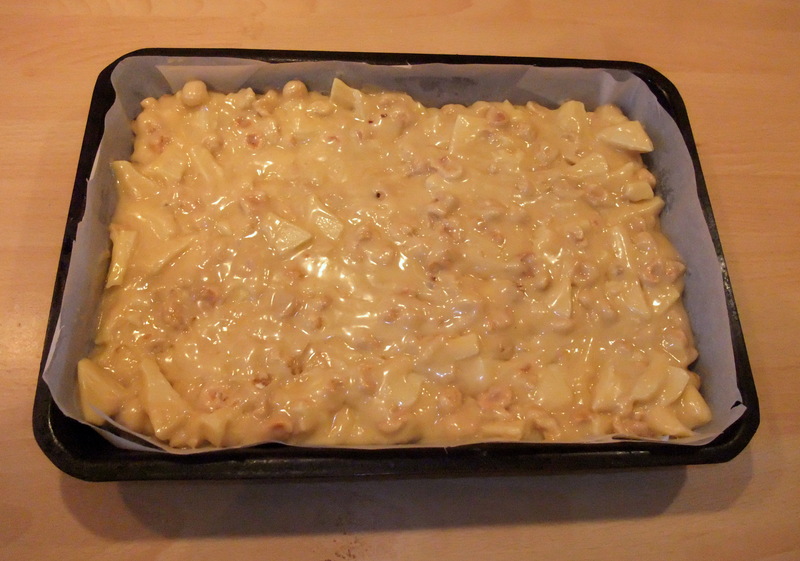 7 ) Add the remaining potatoes, cover and cook again until the potatoes are soft. 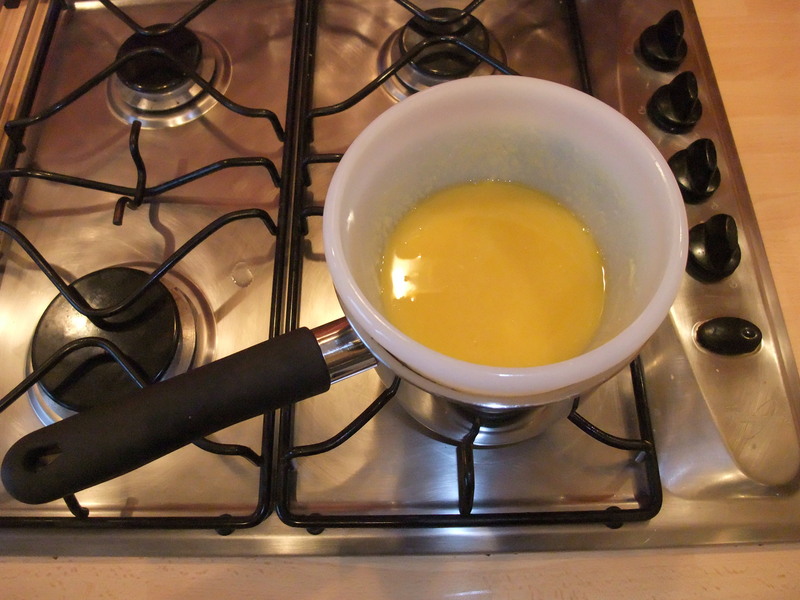 8 ) Stir in the milk and half the cheese. Add salt to taste. 9 ) Serve and add the avocado, remaining cheese and a sprinkling of chilli flakes.